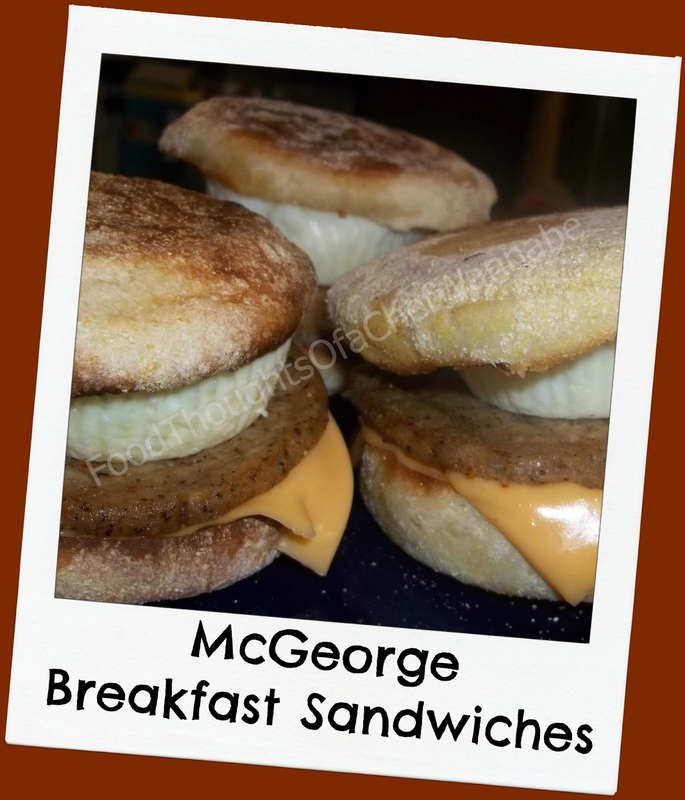 FoodThoughtsOfaChefWannabe: Start YOUR day with a McGeorge! Start YOUR day with a McGeorge! You know for the first time, I caught so much heck for a recipe I posted. So let me clear a few things up from this point on. First off, all things in moderation. I was referred to as "killing children" with my Alien Hot Dogs and Spaghetti recipe, it is recipes like that, that are "handing children heart disease". Oh for the love of all that is holy people, there are a few things you need to understand. 1. MOST kids love hot dogs. 2. It was a fun Halloween or special day kind of recipe. 3. Some people, feed their children what they can afford and don't have so many choices in their diet. Let me rephrase, they have choices, but perhaps, not as many as your finances afford you. 4. I try to write recipes for ALL walks of life and ALL sorts of people. And last but not least, if you don't like a recipe, skip over it. What is the need for the negative, nasty, plain old rude comments? Not in my house folks, I respect everyone's opinions but rudeness is not, and will not be ok here. I believe any food I make at home, and don't buy frozen, or canned, or prepackaged is ALWAYS better because I know what is in it and it isn't full of chemicals and preservatives. At the same time, I use my share of canned or prepackaged items for quick meals. I don't all the time, but let's be honest, we all have times we need things in a hurry. Stop judging, as my husband always says, "When you point a finger, you have 3 more pointing back at you". Keep it in mind and just enjoy the friends, the food and the laughs. Does it need to be harder than that? No! Ok now that I am done with THAT. Let me get to the recipe. It isn't really a recipe, it is more of an assembly but, sometimes, you need some assembly recipes too! I will tell you, I am a sucker for a good breakfast sandwich. I like almost any sandwich. Sue me. These are awesome and my husband used to make tons of them and put them in the freezer. If we were in a rush, we could zap them in the micro and head out the door or take them to work/school frozen and heat them up when we got there. And we would have these for dinner just as often as we had them for breakfast! So we decided we needed either smaller English muffins or a jumbo muffin tin which I am going to pick up this weekend. It really doesn't matter that the egg is smaller, just want it to look nicer. Hubs always does the eggs in a muffin tin and bakes them. This time he used cupcake liners, I assured him it would never work. I even laughed saying, "ok but when we have to make another batch because you can't get the papers off don't forget I told you so". Alas, it worked. He did spray them I think with nonstick spray though. Actually it worked REALLY well. Preheat oven to 375 degrees. Line cupcake pan with liners and spray with a light coat of nonstick cooking spray. Crack your eggs into the cups. Now take a skewer or toothpick and just break the yolk, no need to scramble it, unless you want but just break it. He was adamant I not forget that part! Bake in the oven for 15-20 minutes. You will know when they are done, they will be all white and firm to the touch. While they are baking, toast muffins and butter liberally. Prepare your meat, if you are frying it, baking it, heating it in the microwave, just get it hot! Now for the hard part......layer it on the muffin however you like and enjoy! I actually also made soup the same night, here is that recipe. The Soup With No Name. Easy as can be, but sometimes the simplest things we just don't think of. I hope you enjoy them as much as we do!! We figured the cost of these 12 sandwiches was around 6.00! Very cool idea! Thanks! Going to take a peek at your soup recipe also :) (yeah these will probably kill us all also huh? *L* oh well, we will die happy ;)) Some people are so ridiculous, sorry you had to deal with them. :) Personally I like your recipes!! An easier and faster way to cook the egg is to place it in a coffee cup and microwave for 45-60 seconds. You will need to grease the cup first, but it will produce a perfect, puck shaped egg! Well Julie, I like to think people like my recipes, it was just one hyped up on a kale smoothie from Australia I think. LOL I don't tell people how or what to eat. I have no place doing that. I just cook good food, people can take it or leave it, I just hope they enjoy it. The soup is GREAT AND healthy by thew ay!! Jeff, great idea, but when you are making 12 eggs....!! Might give that a try though one of these times. He has been using the muffin tin for a good 15 years, don't know if we will change him now!! I tried to make an egg in the micro once and when I stuck a fork in it, it exploded all over my face. True story......come on, I know you are laughing! LOL Thanks to you both for reading!!! !